MEMPHIS, Tenn., March 14, 2019 /PRNewswire/ -- Evergreen Packaging®, a global leader in fiber-based packaging solutions, today released a white paper, "Trend Watchers Say the Topic of the Year for Food and Beverage Might Be 'Plant-Based,'" based on data from the annual EcoFocus Trend Study, which forecasts key trends that will shape the U.S. food and beverage industries in the year ahead. Now in its ninth year, the EcoFocus Trend Study examines how consumer attitudes, actions, preferences, and values are reshaping grocery purchasing decisions. The Study finds that plant-based food and beverage packaging is now on the minds of more than three quarters of consumers. Three out of four (76%) grocery shoppers in 2018 say they have heard or read about plant-based food or beverage packaging, and 62% want to learn more about it. Nearly half of consumers are already shopping with plant-based packaging in mind: 46% of grocery shoppers in 2018 strongly agree or agree they "try to buy packaging that is made with plant-based materials" and 47% say plant-based packaging is extremely or very important for healthy beverages. "Better personal health has driven the clean label movement in recent years and will drive plant-based trends in coming years," observes Linda Gilbert, CEO of EcoFocus Worldwide. "When we turn the health lens to packaging, consumer perceptions are clearly and consistently in favor of glass and paper, both for personal health and environmental reasons." 64% of grocery shoppers in 2018 strongly agree or agree "I have changed what I buy in order to reduce our exposure to chemicals from food or beverage packaging." Four in ten or more consumers believe plastic and metal packaging can leave undesirable or harmful chemicals in their foods and beverages. Glass bottles and refrigerated cartons are considered to be the least likely to leave undesirable or harmful chemicals in their food and beverages. The study also identifies a growing consumer understanding and importance placed on packaging from renewable resources and packaging that is recyclable. And, that interest increases with products that are natural or organic. "The plant-based trends create a particularly high level of packaging innovation opportunities for natural and organic products," said DeWitt Clark, Vice President of Sales and Marketing North American Packaging for Evergreen Packaging. "With 61% of grocery shoppers in 2018 strongly agreeing or agreeing 'Natural and organic products need to do a better job of packaging their products with recyclable materials,' it creates an opportunity for brands to differentiate in a competitive market." The full white paper, "Trend Watchers Say the Topic of the Year for Food and Beverage Might Be 'Plant-Based,'" is available for free download from Evergreen Packaging. To read or download the document, please visit evergreenpackaging.com. To stay connected to the company's latest announcements, follow Evergreen Packaging on LinkedIn. Evergreen Packaging is a global leader in creating fiber-based packaging solutions customized to deliver product freshness and brand distinction. Evergreen Packaging makes and supplies paper and paperboard products globally with manufacturing facilities in the US, Asia, Central America and the Middle East/North Africa. Evergreen Packaging is the number one supplier of liquid packaging board in the world. 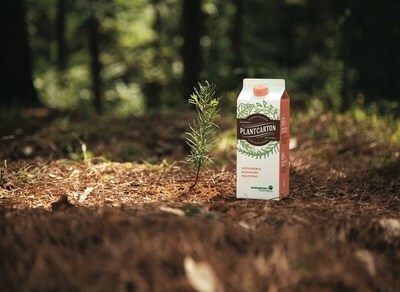 Evergreen Packaging cartons contain protective layers of plastic (including cap and spout). Fiber used in Evergreen Packaging products comes from forests in the US where responsible forestry practices are used and where overall growth exceeds harvest.